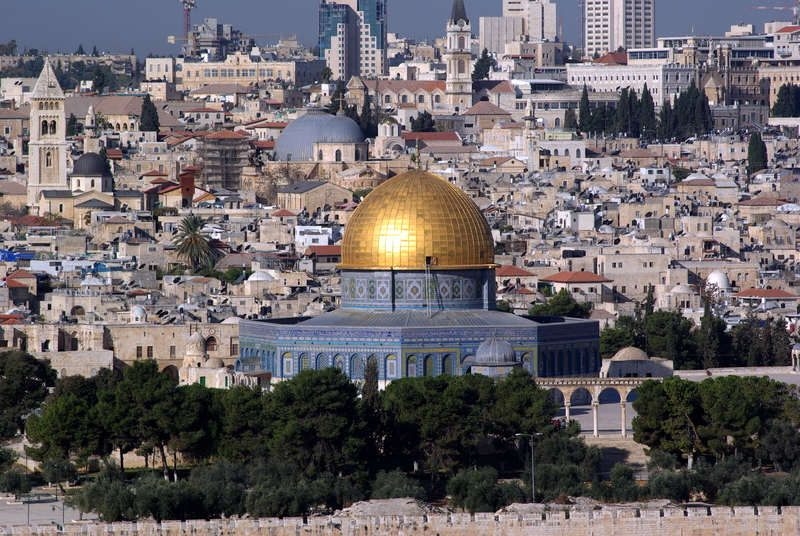 The Gold Dome is the most immediately identifiable image dominating the skyline of Jerusalem. It has stood there for 1300 years, longer in TIME than both the 1st and 2nd Jewish Temples. There is a growing movement of Jewish activist-extremists who want to see the Dome destroyed, and a 3rd Jewish Temple built in it’s place, restoring the Levite Priesthood with the animal blood sacrifice of sheep and goats in atonement for sin. The fundamental of Messianic Christianity is God’s requirement of animal sacrifice by Jews in the Temple, ended when Christ Jesus, by offering his own body as a LIVING SACRIFICE, fulfilled that requirement ONCE, for ALL TIME, and for ALL HUMANITY. ‘The Temple Mount is a powder keg, and arsonists have the upper hand’ This is no accidental fire. This was (and still is) an arson job. But who are the suspects? this morning’s headline reports in Israel’s Haaretz newspaper. Jerusalem is up in arms again. As violence spreads from the capital to other parts of Israel, it seems the question isn’t so much whether the country is teetering on the brink of an intifada, but how the upsurge should be characterized. Some are calling it “the Firecracker Intifada,” in honor of the firecrackers that Palestinian protesters are hurling at the police. Others are going simply with “the third intifada,” though many disagree with that moniker. In any case, the term “Silent Intifada,” previously used to describe the violence in Jerusalem, hardly seems appropriate now. At the center of this craziness stands the Temple Mount, or Haram al-Sharif, as it is known to Muslims. The Temple Mount is the holiest site for Judaism and the third holiest for Islam. It’s one of the most sensitive religious sites in the world — a massive powder keg, if you will. Now that this powder keg looks to be on the verge of exploding, note that this was no accidental fire. This was (and still is) an arson job. The immediate suspects, as many observers have pointed out, are the Israeli right-wing politicians challenging the decades-old status quo on the Temple Mount, over which the Muslim Waqf trust has retained religious control since Israel took over East Jerusalem in 1967. The right-wingers are insisting that Jews be allowed to pray there; they include Knesset members like Likud’s Miri Regev and Moshe Feiglin. These two, Housing Minister Uri Ariel and others have been key to the incredible resurgence of the Jewish Temple Mount movement in recent years, a resurgence that led to rumors that Israel sought to change the delicate status quo. Last week Feiglin visited the site yet again, despite warnings by the police. Others like another Likud MK, Tzipi Hotovely, expressed wishes to follow suit despite charges they were fanning the flames. Foreign Minister Avigdor Lieberman and Defense Minister Moshe Ya’alon admonished them; in an interview with Channel 10, Ya’alon admitted that the current violence had at least been partly stoked by ministers and MKs who defiantly visited the Temple Mount. If Lieberman and Ya’alon have to tell you you’ve gone too far, you can be pretty sure you’ve gone too far. It’s not for nothing that Lieberman and Ya’alon, not to mention Prime Minister Benjamin Netanyahu, President Reuven Rivlin and much of Israel’s security apparatus, appear so agitated over the mount these days. Over the years, maintaining the status quo there by prohibiting Jewish prayer was critical to preventing an all-out religious war. The status quo wasn’t perfect by any means, but it allowed a delicate balance between the national and the religious. That balance is now eroding fast. The history of the Temple Mount is, of course, fraught with conflict. For many years, extremists — both Jews and Arabs — have battled over, or against the backdrop of, this tempestuous holy site. In 1929, 133 Jews were killed by Arabs partly motivated by rumors of a planned Jewish takeover of the mount. In 1996, riots broke out there following Netanyahu’s decision to open the Western Wall tunnels — a decision that again led to rumors of an imminent threat to Islamic control of the site. Seventeen Israeli soldiers and more than 100 Palestinians died, and scores were wounded. In the 1980s, the Jewish underground, a terrorist organization formed by members of the right-wing movement Gush Emunim, almost blew up the mosques on the mount, including the Dome of the Rock. The idea was to further a messianic redemption that would culminate with the construction of a Third Temple. In September 2000, Ariel Sharon (then opposition leader) made a high-profile visit to the mount. The day after, riots broke out there following Friday prayers, launching the second intifada. But now, at the outset of what may or may not be a third intifada, something is different. It’s not the violence as much as the way the events are being framed. For the most part, the movement to regain Jewish control of the Temple Mount has been limited to extremists. Sharon’s 2000 visit, for example, was seen as a dangerous provocation. Until a few years ago, any talk of change at the Temple Mount was a surefire sign of religious madness, the stuff of eccentrics and the certifiably insane. Not anymore. These days there appears to be a wider acceptance for a Jewish Temple Mount, tracking Israel’s right-wing shift and the erosion of its resistance to messianic rhetoric. The movement, still a minority movement, has gained mainstream recognition in recent years and won influential supporters in the Knesset. Regev, chairwoman of the Knesset Interior Committee, has chaired no fewer than 15 debates on the subject in the past year alone, hounding police officials for their “cowardly” response to the harassment of Jewish visitors to the mount. Two weeks ago, hours before right-wing activist Yehuda Glick was shot by East Jerusalemite Mutaz Hijazi, Regev reminisced how she initially thought the Temple Mount movement was “outlandish” — before she was ultimately convinced. Glick, now in recovery, was, as my colleague Anshel Pfeffer has pointed out, key to the mainstreaming of the Temple Mount movement. An affable, red-bearded oddity, Glick — who went on a 53-day hunger strike last year after being barred from the mount — often befriended ideological rivals and depicted his struggle as a pure freedom-of-religion issue. By portraying the issue as a civil-rights debate, he played a key role in the massive PR resurgence of the Temple Mount movement. Glick’s affability aside, the proliferation of Israeli visits to the mount and the growing conversation about the site — much aided by opportunistic Hamas propaganda — helped increase tensions and led to the formation of local groups like al-Murabitun, self-proclaimed guardians of the site against the rumored “Jewish takeover.” The clashes that followed led to the violence we’re seeing now. The vast majority of Israelis and Palestinians, of course, don’t want a religious war. Israel’s foremost religious authorities, among them Sephardi Chief Rabbi Yitzhak Yosef, have reiterated their stance against Jewish visits to the mount. The vast majority of Israelis have never visited the place and probably have no intention of doing so. Most Palestinians, meanwhile, have more pressing material concerns. Unfortunately for those people, it seems there are plenty of arsonists among us. And right now they seem to be enjoying the upper hand. Behold, your house is left unto you desolate: and verily I say to you, You shall not see me, until the time come when you shall say, Blessed is he that comes in the name of the Lord. Glick and his ilk want to move Israel backward, not forward, in wanting to re-instate animal blood sacrifice for sin, denying Christ who sacrificed his living body for all sin, once and for all. 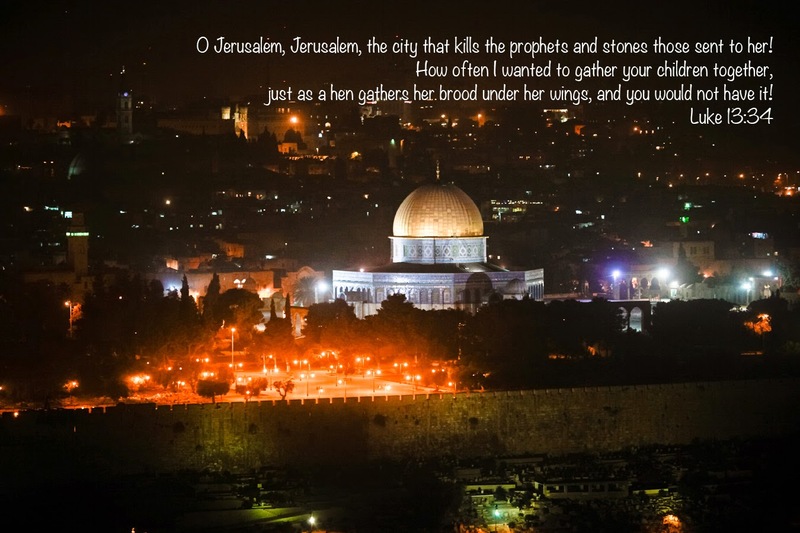 The Messianic Settlers, their spiritual leaders and advisors, who have taken over Likud and the government, ignore the words of the Prophets at Israel’s peril. Hear the word of the Lord, O rulers of Sodom; give ear to the law of our God, O people of Gomorrah! Of what use are your many sacrifices to Me? says the Lord. I am sated with the burnt-offerings of rams and the fat of fattened cattle; and the blood of bulls and sheep and hegoats I do not want. When you come to appear before Me, who requested this of you, to trample My courts? You shall no longer bring vain meal-offerings, it is smoke of abomination to Me; New Moons and Sabbaths, calling convocations, I cannot [bear] iniquity with assembly. Thus says the LORD, The heaven is my throne, and the earth is my footstool: where is the house that you build for me? and where is the place of my rest? For all those things have my hand made, and those things have been, says the LORD: but to this man will I look, even to him that is poor and of a contrite spirit, and trembles at my word. This solid earth is physically moving through space around the sun at a rate of some 100,000km every hour, while rotating on it’s axis around 1675km/hour. Do you feel it? Do you sense it? 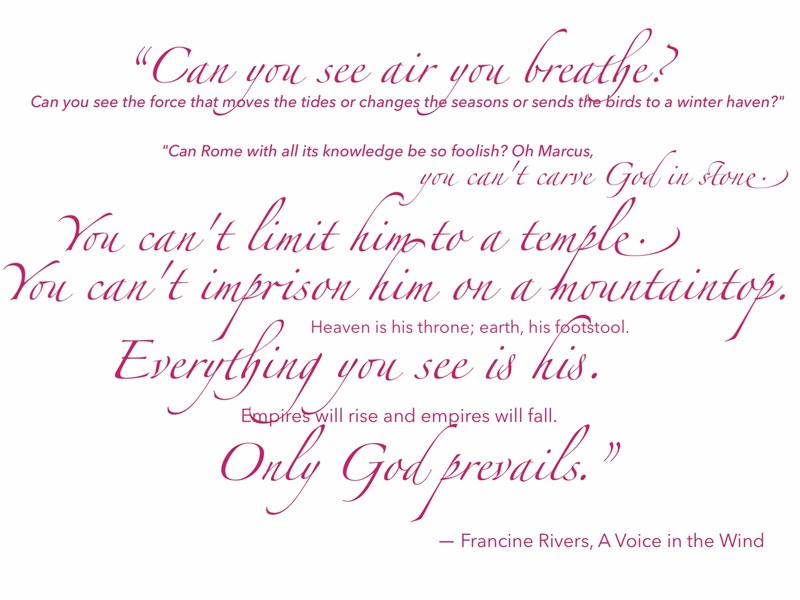 Why should it be such a great leap to believe in an invisible God who becomes visible to those who believe by Faith and look for God? In addition to the rising tensions over the Temple Mount, the following Haaretz reports detail some of the usual Israeli humiliation and provocation of the Palestinians in the 47 year Israeli Military Dictatorship in the occupied territories separate from Gaza. Ten torched mosques, zero indictments Since June 2011, 10 mosques in Israel and the West Bank have been set on fire by presumed right-wing Jewish extremists. No charges have been filed. When the Israeli FBI, Shin Bet, can find and kill a Palestinian suspect in hours, I can only imagine how frustrated and suffocated the Palestinians must feel with such double standards in police work and results. Some 92 percent of complaints filed by Palestinians are closed and the criminal never found, according to a report by the Yesh Din human rights group, which has been tracking 1,045 complaints filed through the organization since 2005. The list of complaints includes shooting attacks, assault, stone-throwing, arson, cutting down trees, animal abuse, crop theft, construction on Palestinian-owned land, threats and attacks. All the actions mentioned in the complaints were committed by Israeli citizens. American Zionist Christians want to see Armageddon come. They praise the Lord and pass the ammunition. It’s the DEVIL’s work, not God’s Will. Both religious and non-religious understand the implications of the word ‘Armageddon’ and the pictures it raises in the mind. It was derived from Har Megiddo, a physical place located in the occupied territories of Judea and Samaria in Palestine 2000 years ago. Israel had ceased to exist some 800 years earlier. before Jesus walked in the Occupied Territory. Har Megiddo/Armageddon still exists as a physical place TODAY, except it is now located in temporal Israel, recreated from the Bible after an absence of some 2800 years. It should at least be a wonder to all thinking people, how it came to be, that after 2000 years of a bloody human history of Wars and Conquest, Nations and Empires, Invasions and Resistance, Politics and Powers, the most explosive and divisive issue confronting this world TODAY, is STILL over the occupation of Judea and Samaria in Palestine? This article in Haaretz Friday sums up the present danger unfolding in Israel Today. Netanyahu is appalled at the possibility that Temple Mount activists will become part of the governing faction, but their agenda is already voiced by some ministers. As if to confirm the views in this article, these are the latest developments concerning The Temple Mount. articles here. Your page can go viral. You need initial traffic only. Thanks for your comment, Joe. I started this Blog in 2011 and in 11 months that year, there were 14,067 views. The next year, in 2012, it went up over 10,000 to 24,872 views. I would have thought that would have improved the Google ranking, but the next year, in 2013, the views dropped by 2/3 to 7,762, and has been decreasing ever since. I don’t understand it and don’t know how to reverse the trend.